Over the years, I’d been relatively agnostic on gold. I used to favor stocks over all other asset classes just given the long term returns, volatility and underlying fundamentals. Then I started to consider my very high concentration in equities and branch out a bit. First off, I got into rental real estate at a local college campus. I figured the steady income mixed with a purported inflation hedge would be a good diversifying component with no correlation to stocks. As it turns out that investment hasn’t really provided income as of yet as we’ve had a few bouts of bad tenants, an empty unit, etc. We’ve paid down the principal, but no income. Then, there are the other alternative investments to consider. I did enter into the gold asset class through the GLD ETF a few years back. It’s done OK and it’s up, even in spite of this year’s pullback. The ETF was a bit of a lazy man’s approach in that it was easy to get into but has its share of drawbacks. For one, many people question whether the underlying custodian actual owns anywhere near the amount of gold that the net asset value represents. Next, there’s an annual expense ratio and there are transaction costs and taxes in and out. For these reasons, many people look to physical gold from sources like Bullionvault.com. If there’s one thing I’ve learned about gold in recent years it’s that while many people feel it defies logic to continue to increase in value for what they cite as a lack of real-world utility, it still does nonetheless! Why? It’s finite. Other things are finite as well, and they tend to increase in value also – primarily commodities. But take another new “class” which has gained in popularity recently. Bitcoins. I view this electronic currency as much more troublesome than any commodity, yet somehow, they have grown tremendously in value and popularity over the years as well. There’s something about a proven finite limit to a particular good that drives prices higher, even if the real-world utility is somewhat questionable. At least gold has millenia of history behind it as a currency and store of value. Personally, I’m not one to mortgage the house and buy nothing but gold since I want diversification and steady income. However, I’m glad I did buy some. It has zigged when the market has zagged and in the event of a major calamity or hyperinflation, I do look forward to the day when I can sell it at a decent profit and reinvest in a bargain stock opportunity. I have never been a gold enthusiast! I remember a boss who invested in gold in the 1970’s when it peaked at $800. I prefer to invest in companies. I do own silver in serving pieces so I guess I still can take advantage of the commodity play. Gold has a very long history of being used as money. That history goes back to ancient times, most notably in Asia and the Middle East, along the old trade routes through China, India and on to Europe. It has been notable that China and India have been major buyers of physical gold for many months now. The Chinese have even encouraged their own citizens to buy gold recently. 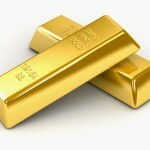 The Western media have focused on the paper markets, rather than the real physical gold. As the gold price was falling recently, the demand for physical gold increased and supply became very tight. Gold is best seen as a long term investment which will maintain its purchasing power compared to any fiat currency. If you can hold the physical gold and can keep it stored safely it is sensible to have gold as an asset, especially if you are looking ahead and considering retirement savings.